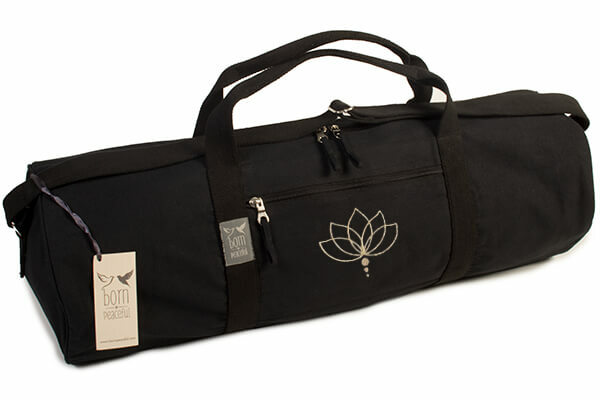 The Born Peaceful Yoga Mat Bag / Hold-all / Yoga Kit Bag. 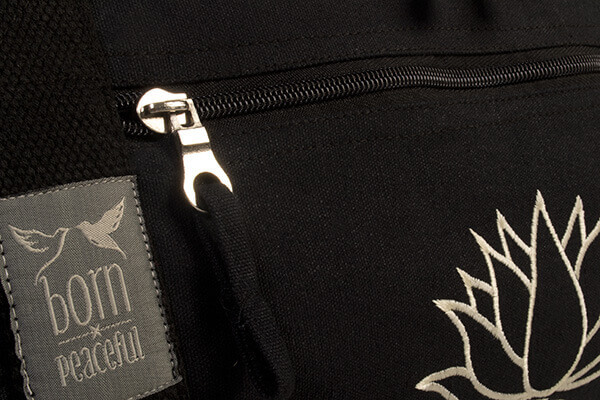 This beautiful mat bag is made of strong, robust 100% cotton canvas with a cotton lining. It has strong webbing carrying handles and an adjustable webbing shoulder strap. 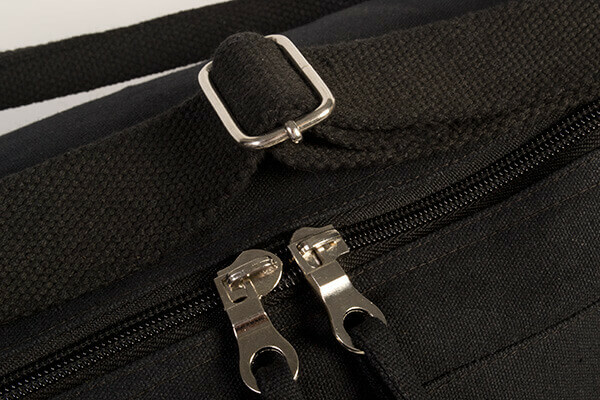 Easy access for your mat is via a full length quality double zip opening. 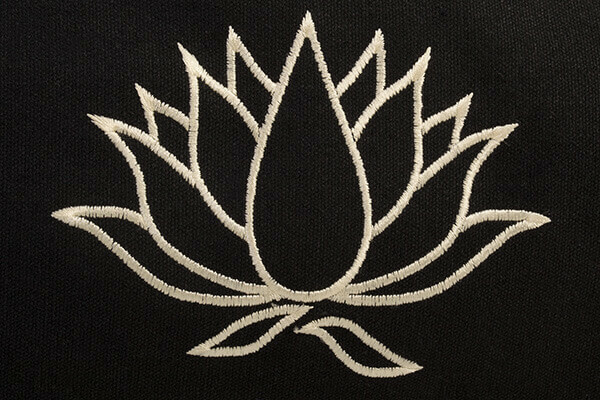 Featuring a subtle yet stylish Lotus Flower embroidery to front pocket and Born Peaceful logo on the webbing. Perfect for your yoga class, a weekend retreat or overnight stay, this roomy bag will accommodate most yoga mat sizes as well as leaving plenty of space for other accessories such as a block, straps, a blanket or a change of clothing. There are also exterior and interior pockets to store other items such as keys, phone, toiletries etc. Care: This bag is machine washable at 30° on it's own. Use an eco-friendly mild washing powder with a very small amount of fabric conditioner (if required). Re-shape whilst damp and allow to air dry naturally. We recommend that washing is undertaken only occasionally to maintain the depth of colour. Great bag, fits in my mat, block, brick, water bottle and blanket if needed. The pockets are large enough for my purse and phone. it and the other products I ordered arrived the next day and beautifully packaged. I am very pleased with this bag which is made of soft material and is light to carry. The over-body strap is particularly useful if you walk to class. It is very spacious, plenty big enough to carry my Lotus Pro mat (also from Yoga Bliss), blanket, block and water bottle. It could be used as an overnight or even weekend bag. Yoga Bliss is a great company to deal with. 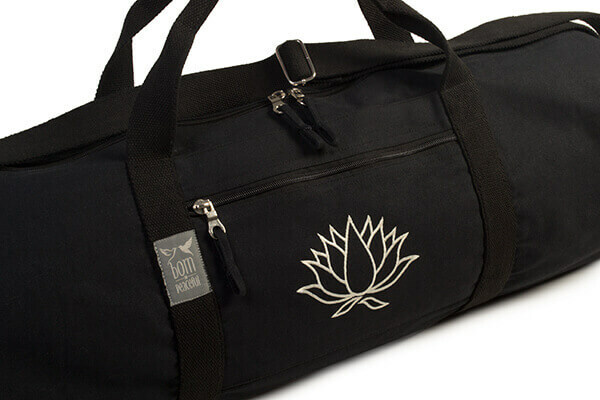 This bag fits my very thick (182x61x1.5cm) yoga mat perfectly and is strong and comfortable to carry. The refund for my previous purchase (which I made in error due to not reading the size info) was processed quickly. Great company who I will be using again. Big enough for yoga mat, blocks, shoes and clothes. Appears to be very well made. Ordering and delivery were quick and efficient. Can fit my mat, blocks and lots more besides! I love this holdall. I'm new to yoga and I wanted something big enough to hold all of the equipment I've acquired. It's beautifully made and is well worth the money. Thank you Yoga Bliss! I only do yoga at home so this was a luxury buy really. I was given some money and bought this, a new mat and a blanket. This bag is good quality, feels it will last a long time and the material makes it flexible enough to put all sorts of things in. I currently have 4 blocks, a mat with a towel and a blanket. It has a small zip pocket inside and another outside. I have put a strap in the inside one. This is now quite full but as I have to keep my yoga equipment in a different room to where I do my yoga it is great to just pick up my bag and have everything to hand. I love the lotus flower -without something like that it would look very plain. Very pleased with the service. The bag is certainly large and well made. Thank you. This is a really great bag, well made and comfortable to carry (or sling over your shoulder). I can fit 3 mats, 3 blocks and a really big blanket in there plus assorted straps! Would definitely recommend! Excellent service and quick delivery. The bag is exactly as described. It holds my mat, two blocks, strap and water. I can also add my yoga blanket. The packaging was lovely, very nice touch. I am delighted with my new yoga bag. I would definitely recommend buying rhis bag and I shall definately order from yoga bliss again. I bought this holdall as it is roomy enough to carry my bolster around to classes. It is well made of pleasing design. I love this bag! It's light but very sturdy & well made. You can easily fit a mat plus towels, toiletries and a change of clothes in there. I think it's going to be useful as a weekend bag as well - any excuse to use it! I was delighted with my new Yoga Mat Bag which arrived in double quick time. I have been able to put my mat, blanket (also purchased from Yoga Bliss) block and strap into it and there is still some room left. I love the motif. This product is exactly as descrbed. My Daughter was very pleased with her new bag. Fast delivery too. Many thanks. I love this bag. I've just used it for a yoga retreat away and it was the perfect size for my mat and 3 changes of yoga clothes, my overnight toiletries, my bottle of water and a spare pair of shoes. This morning I used it with just my yoga mat for normal class and it's light and comfortable to carry. Useful inside and outside zipped pockets for valuables etc. It looks great too! This bag is perfect to carry everything for a yoga session. Size weight and enough pockets to hold smaller items. Perfect carry all yoga bag! This bag is the perfect size to fit a mat, blanket, pillow, blocks in. It is really great quality and the small pockets on the inside an outside are perfect for keeping keys, phone and other valuables. Definitely worth the £40 and I would highly recommend this product if you are looking for a good quality carry all yoga kit bag!